Legacy, heritage and at-risk data share one common theme: barrier to access. Data that has been recorded by hand (field notes, lab notebooks, handwritten transcripts, measurements or ledgers) or on outdated technology or using proprietary formats are at risk. Born-digital files can be at risk too, since they can be susceptible to poor management, bit rot, or even direct attempts at reducing access. 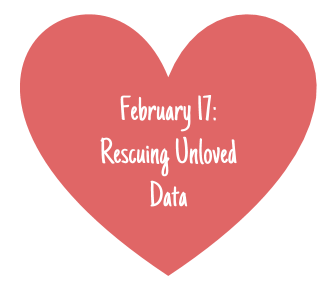 This entry was posted in Data cleanup, Data rescue and tagged Love Your Data Week, LYD17. Bookmark the permalink.